Sciatica involves pain along the distribution of the sciatic nerve, the largest single nerve in the human body. The nerve begins in the lumbar region of the spine, goes deep and emerges just below the buttocks, and ends just above the posterior knee. Sciatica is not a medical diagnosis, but rather a symptom of underlying disease. The nerve is compressed or irritated in some way, leading to characteristic symptoms. Descriptions of the pain experienced with sciatica vary widely. Sciatica nerve pain can be described anywhere from burning to cramping. It can be infrequent and annoying to constant and excruciating. Exacerbating factors may include prolonged sitting, coughing, or sneezing. There is almost never any permanent sciatic nerve damage. The incidence of sciatica peaks in middle age. Sciatica has a variety of possible etiologies. The most common cause is a herniated disc in the lumbar region of the spine. 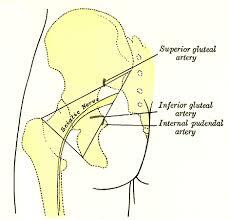 The gel-like contents of the disc leak out, or herniate, causing irritation of the sciatic nerve root. Other names for a herniated disc include slipped disc, bulging disc, ruptured disc, and protruding disc. A thorough medical history and physical examination with imaging studies (X-ray, MRI, or CT scan) provide the diagnosis in most patients. Must Watch Video – What is Sciatica? Other causes of sciatica include degenerative disc disease, piriformis syndrome, lumbar spinal stenosis, and spondylolisthesis. Degenerative disc disease refers to the degeneration of discs in the back and is usually a result of aging. Piriformis syndrome refers to spasm of the piriformis muscle as it runs above the nerve root. 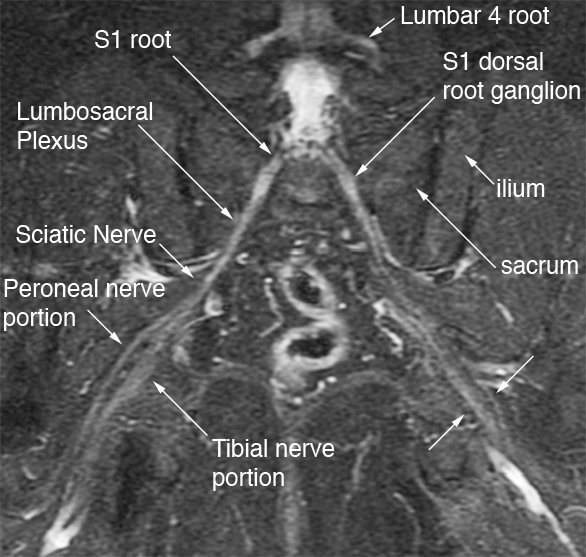 Spinal stenosis results in a constriction of the sciatic nerve as it exits the spinal canal. Spondylolisthesis occurs when a backbone, or vertebra, slips forward onto another. All of the etiologies referred to above cause compression or inflammation of the sciatic nerve root, the origin of sciatica. A variety of treatments are available for sciatic nerve pain. Most patients respond to conservative non-surgical measures. Heat or cold therapy alleviate symptoms for some. A regimen of 20 minutes every two hours or so is recommended. Treatment should also consist of over-the-counter anti-inflammatory medications such as ibuprofen (Motrin), acetaminophen (Tylenol), or naproxen sodium (Naprosyn). Individuals with severe or long-standing symptoms are candidates for other measures such as muscle relaxants, oral steroids, antidepressants, opioids, or anti-seizure medications. The aforementioned measures are usually instituted along with a course of physical therapy sciatica exercises. Physical therapists will prescribe strengthening, stretching, and low impact aerobic exercises. Strengthening core muscles goes a long way in treating and preventing future episodes of sciatica. Low impact aerobic exercises for sciatica such as walking and swimming are especially efficacious. Epidural steroid injections are another avenue of treatment for those with severe or chronic discomfort from sciatica. In the procedure, steroids are injected in the vicinity of the inflamed nerve. Steroids are potent inhibitors of inflammation. Caution should be used with epidural steroid injections, as they should be given no greater than three times in a 12-month period. Approximately 50% of patients report some pain relief with these injections. Surgical treatment may also be a part of a regimen designed to combat sciatica. It should be considered in those with progressively worsening symptoms, chronic pain, or worrisome symptoms like bowel or bladder incontinence. Options include minimally invasive surgery, or microdiscectomy, and open decompression, or lumbar laminectomy. A microdiscectomy is performed with microscopic magnification to remove sections of a diseased spinal disc. It is the treatment of choice for those with a herniated disc causing symptoms of sciatica. An open decompression involves cutting out the posterior part of a backbone (vertebra) that is tenting the spinal cavity. It is designed to free up the sciatic nerve root from compression by spinal stenosis. Again, a majority of individuals undergoing surgery report decreases in pain from the ravages of sciatica. In the end, it is the patient’s decision whether or not to have surgery for relief of this condition. Alternative treatments exist for those wanting to avoid medications, steroids, or surgery. Three of the most commonly used alternative measures are acupuncture, massage, and spinal adjustment. These treatments should all be performed by qualified, certified professionals. Other alternatives include yoga, biofeedback, and transcutaneous electrical nerve stimulation (TENS). These alternatives can provide a healing milieu for those afflicted with this condition. Sciatica is a symptom of underlying disease that compresses or irritates the sciatic nerve. The irritation manifests in a myriad of ways such as burning, tingling, numbness, and dysfunction. There are numerous origins for this symptom, most of which are in the lower back. In the majority of sufferers, the pain of sciatica resolves with time and rest. About half of patients report resolution of symptoms within six weeks. Non-surgical treatment relieves pain in 80-90% of patients. Surgical treatment should be considered in those patients with the worst of symptoms. Prevention of sciatica involves regular exercise, proper posture, and good body mechanics. Koes BW, van Tulder MW, Peul WC. Diagnosis and treatment of sciatica. 2007;334:1313-7. Selim AJ, Ren XS, Fincke G, Deyo RA, Rogers W, Miller D, et al: The importance of radiating leg pain in assessing health outcomes among patients with low back pain. Results from the Veterans Health Study. 1998; 23:470–474. Vogt MT, Kwoh CK, Cope DK, Osial TA, Culyba M, Starz TW. Analgesic usage for low back pain: impact on health care costs and service use. 2005;30:1075-81. Weinstein JN, Lurie JD, Olson PR, Bronner KK, Fisher ES. United States’ trends and regional variations in lumbar spine surgery: 1992-2003. 2006;31:2707-14.